I’m going to square with you from the start: I love the Harry Potter books – they are my favourite series of books and I have read them far too many times to mention! However, I don’t love the films that much. Mainly because the films don’t portray the story how I’d imagined it when I was reading the books – I created this amazing world in my imagination and the films didn’t come close to what I’d developed over ten years of reading about this magical world. It was always going to be a difficult task, a nigh on impossible task, to satisfy fans with one film, one interpretation of the books which had ignited the imagination of millions and millions of readers. So, the tour. After a painfully awkward intro video by Watson and Radcliffe the tour began. We started of in the indoor sets; the Great Hall, the Boys’ Dormitory, Gryffindor Common Room, the Burrow etc. and the most striking thing for me was the utterly amazing attention to detail which was taken over everything. Each potion bottle has a handmade, handwritten label. Each of the 17,000 wands in Ollivander’s was individually boxed and labelled. The Daily Prophet was created and written! I could go on and on and on, the details were simply staggering! 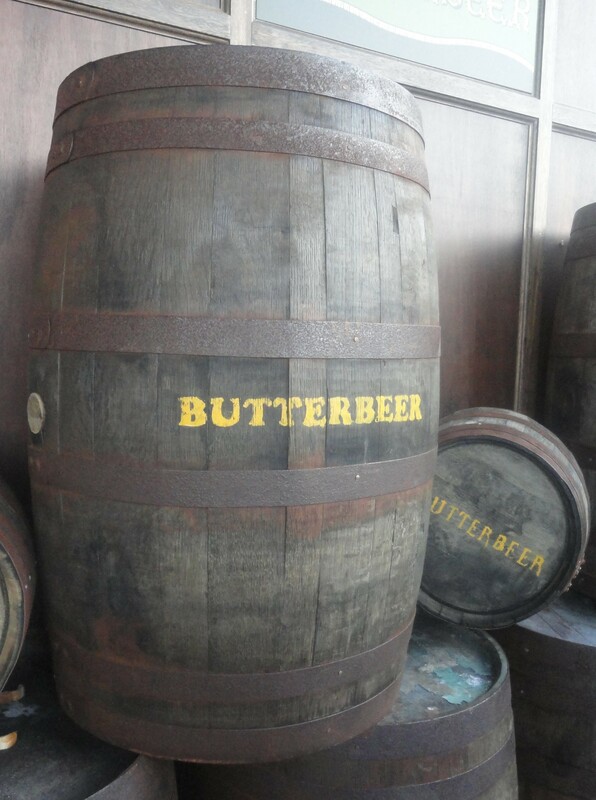 We drank Butterbeer! As was repeatedly mentioned, you can only get Butterbeer in Watford and Orlando so we gave it a go. It was strange but nice. A bit like a coke float but with cream and it kind of tasted buttery/caramelly… It was strange and definitely not to everyone’s taste! After the butterbeer we headed to the art and prosthetics department which was fascinating and my favourite bit of the day. 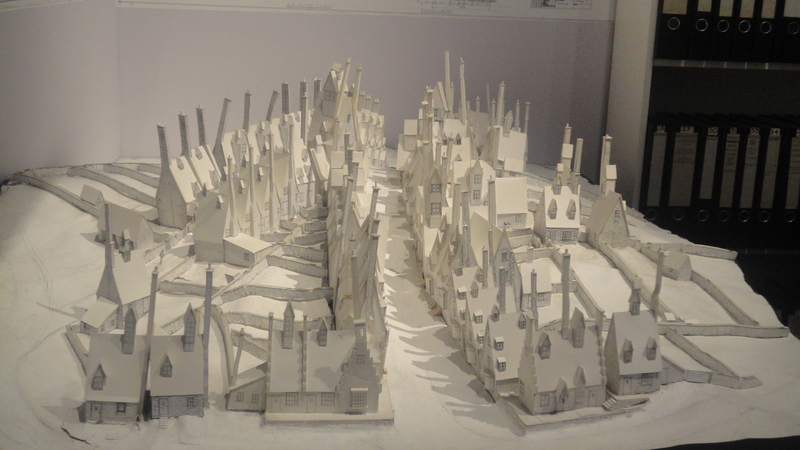 Beautiful concept drawings lined the walls, stunning scale models of Diagon Alley and Hogwarts filled the rooms and it was just amazing. The amount of work, passion and dedication into the designs was something to be admired. The final step of the tour is a 1:24 scale model of Hogwarts which, as I rounded into the room, made my jaw fall open. Again, the superb and intricate detail was incredible. I took about 100 photos of this model (and everything else!) but I won’t put many of them on here because I wouldn’t want to ruin the surprise for anyone going to visit! Then we walk into a room full of wands. Each individually crafted and labelled for every cast and crew member of the series. A touching and dramatic reminder of how much work went into the films. Last but not least, the gift shop… £25 for a wand, £25 for a scarf, £25 for the Marauders Map… see a pattern emerging? It was frightening how much money was spent in that gift shop. Truly mindblowing how much visitors can spend on memorabilia. There were a set of replica Dumbledore robes on sale for £495. Four HUNDRED and Ninety-Five pounds. I hope you’re as gobsmacked as I was… Maybe I’m just not rich enough to spend that kind of money on things other than rent… But after shocking myself into submission I bought a postcard for 95p. Wands, wands and more wands! It was wandering around the art department when I realised how many people truly loved and cared for the Harry Potter series. 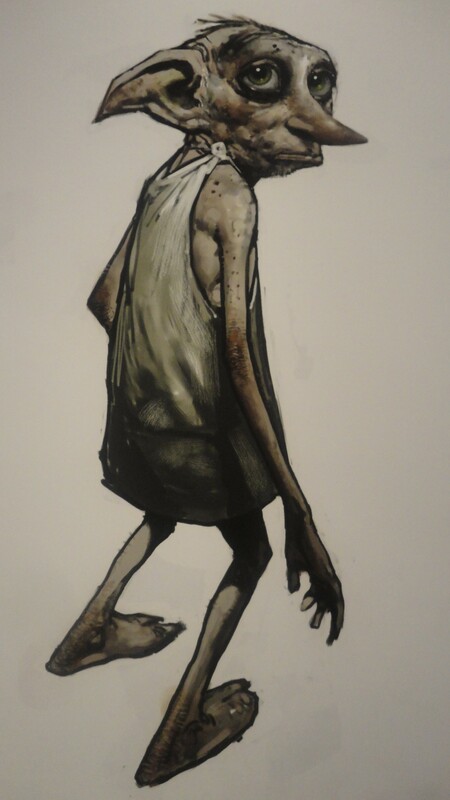 (The picture of Dobby above was painted by one of the chaps in the art department.) I understood that so many people worked so hard at the minute details of the films because they wanted to show their love for the series through their creative skills. No-one who worked on that film wanted to let Harry down, let the fans down or let JK Rowling down; because the books mean so much to so many people and that is the most significant thing I take away from the tour. It didn’t make me want to watch the films again, it made me want to read the books again and become submerged in the magical world that I created once more. Have you been to the Studio Tour? What did you think?? Leave links and comments below!